To help get you psyched for Friday’s A Place To Bury Strangers show at Music Hall of Williamsburg, here is a some live footage of APTBS at Braund Sound. 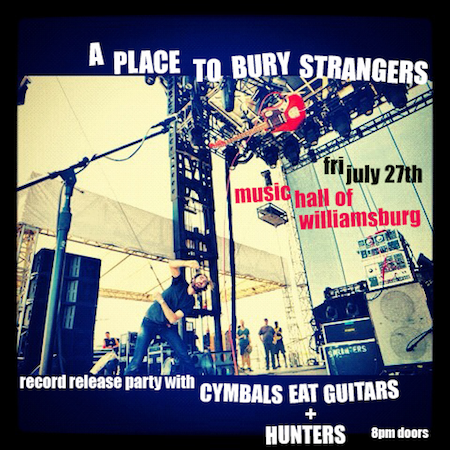 Also playing on Friday are Cymbals Eat Guitars and GT favs Hunters. You can watch a music video from Cymbals Eat Guitars @ The Barsuk Youtube, and there is some recent footage of Hunters @ The GIMMETINNITUSTUBE. If you missed it on the GIMME Tumblr, you can check out the Braund Sound session for “You Are The One” by APTBS @ gimmetinnitus.tumblr.com.